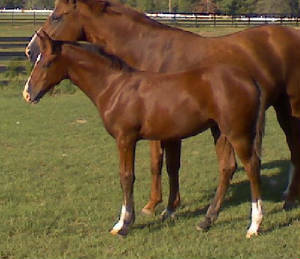 The following are pictures of our homebred offspring, along with their accomplishments over the last few years. 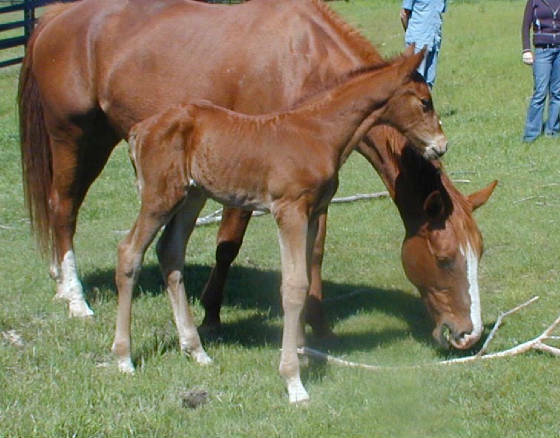 Our first foals were born on our farm in 2005, and are now 4 years old. 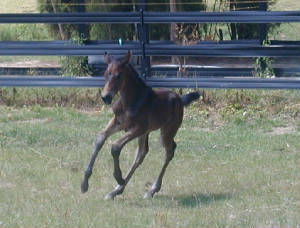 Our older offspring, starting in 1995, were born at various places along the way...enjoy the photos! 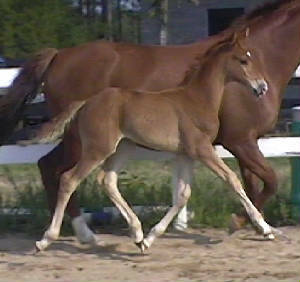 Our last foal of the year was Worth It ESE, by Welcome S, out of MS Destination (Donnerschall x Wilhelm Tell II) He is also a big boy, with some of the best movement we have produced in our breeding program! 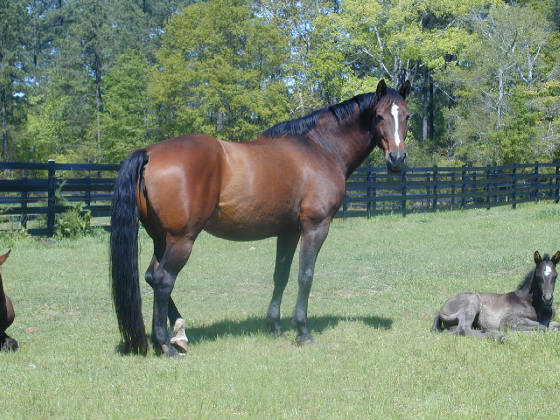 He was conceived just a few weeks before his sire passed away at the age of 26. 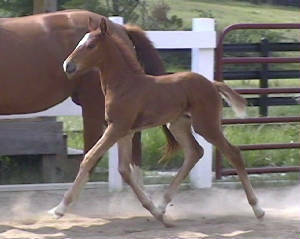 We are very grateful to have been able to produce this wonderful colt!! 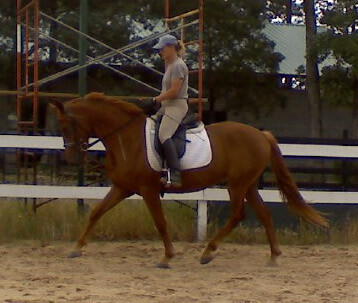 Welcome S was a Grand Prix Dressage Champion, and was at one point Number 1 in the World in Dressage! 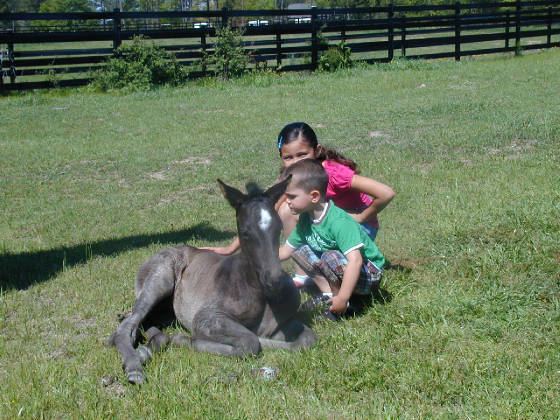 Our first born for 2009 was Dark Knight ESE, aka "Heath." 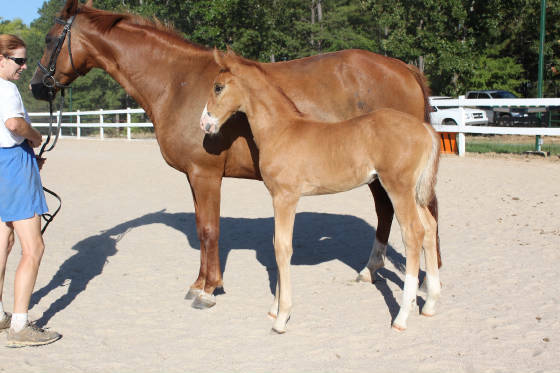 He was purchased In-Utero by Marilyn Gilligan, and sold after weaning to Michaelle Scott, of Chapin, SC, and he continues to be raised here at Emerald Spring! 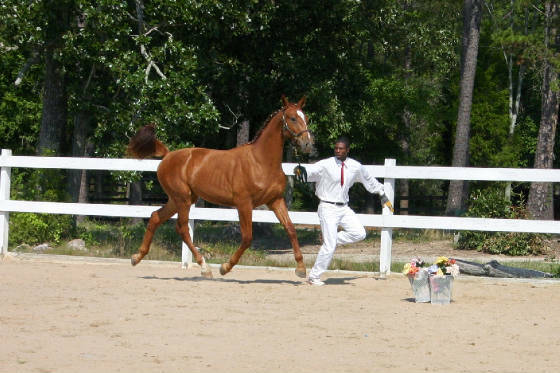 Heath is an american Hanoverian by the stallion De Laurentis (De Niro x Caprimond,) and out of Ragazzi, by Rouletto x Akzent II. 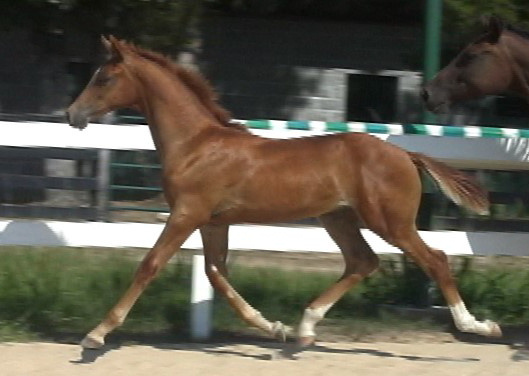 Not to be outdone, Tigris (Nicholas x Dederick) gave us a beautiful colt by Escudo II (Espri x Arkansas) the following week! 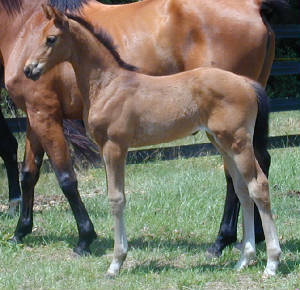 Foals of 2008...see how they grow! 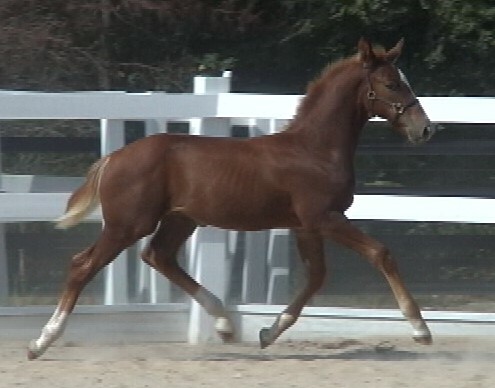 Freya ESE: 2008 Hanoverian Filly by Fabuleaux, out of MS Destination, by Donnerschall x Wilhelm Tell II. 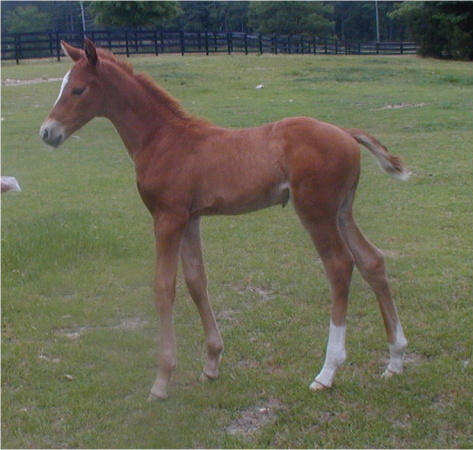 This is one of the prettiest fillies we have ever seen. She is a true princess, with a fabulous disposition! 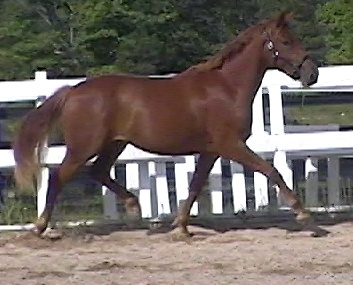 Borealis ESE: 2008 Hanoverian Gelding, by Bergamon, out of MS Daybreak, by Dederick. 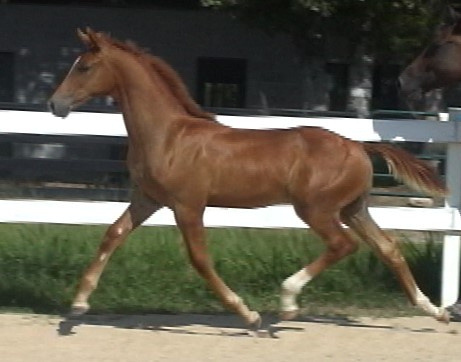 Sold as a weanling, and will be having a career in the Dressage ring. 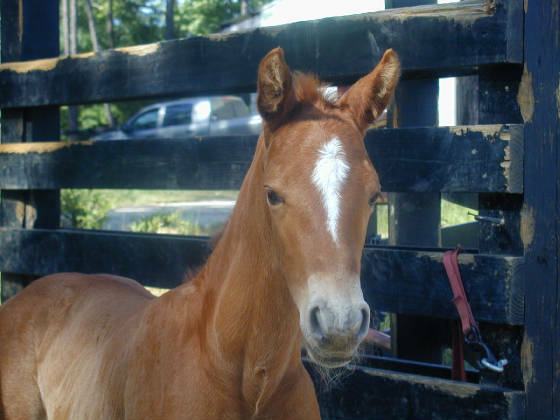 This handsome colt is being raised with us, and has proven to be a stellar little fellow with a great attitude! 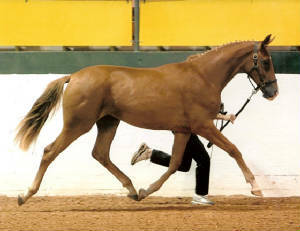 Illusionist ES, by Escudo II, out of Tigris, by Nicholas. 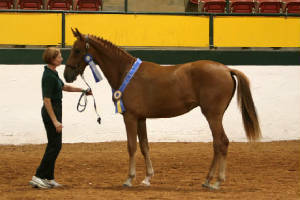 This young man is an outstanding example of our second generation breeding program! 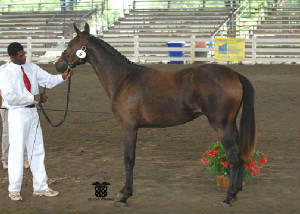 He was a Top Foal at his Keuring with 84 Points, and was tied for the Third Highest Score in the USA with BWP. 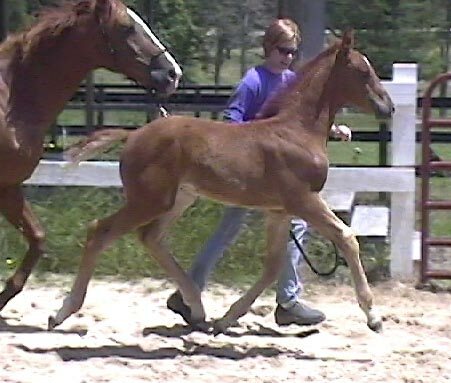 In addition, he has an outstanding personality and has inherited his sires renowned intelligence and learning ability...he will be a BIG boy, too...probably in the 17 Hand range. 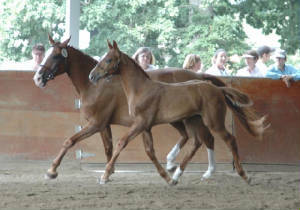 In 2007, we had two beautiful fillies by Liberty Gold. 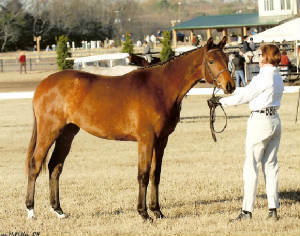 The firstborn, Lucia ESE, is being kept as a broodmare prospect, and we hope to have her achieve Elite Status with AHS. 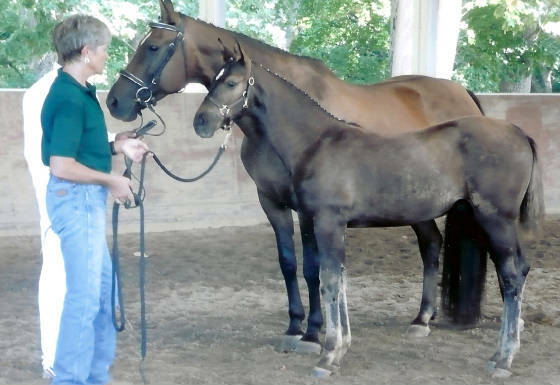 The Second, Legacy Gold, was sold as a weanling to Sherry Anne Smith, and is being raised by us, and will be started under saddle by Dawn, and hopefully be a star in the Dressage ring. 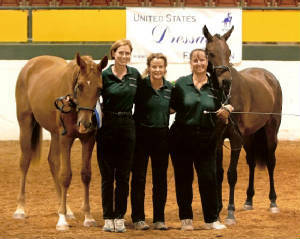 Team Green at the Raleigh Bred Show, where Lucia won the Hanoverian IBC, and Legacy Gold placed third. 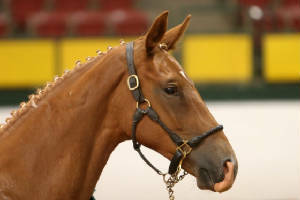 "Lacie" has done well in hand at the USDF Breed Shows. 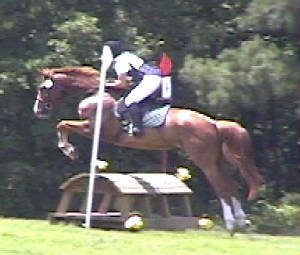 "3" seems to be her lucky number, as she has placed Third in large classes every time out! 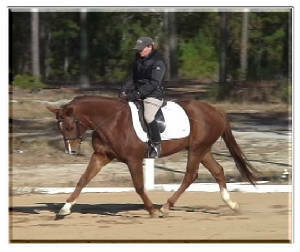 She qualified for the USDFBCS in Atlanta last year, and we are very proud of her! 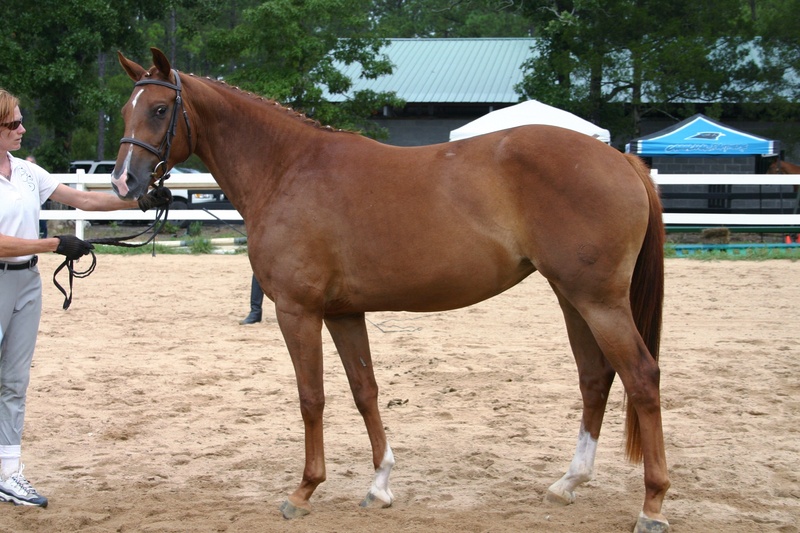 Lucia ESE, by Liberty gold, out of MS Destination, by Donnerschall, pictured at Raleigh: Lucy has also been shown successfully at the USDF Breed Shows, having won the Hanoverian IBC at Raleigh, we took her to Atlanta, where she won the Yearling Fillies class. Bella Notte ES, by Flemmingh x MS Daybreak, by Dederick. 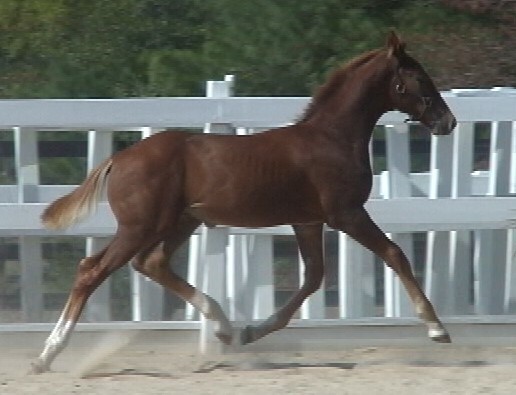 2006 Dutch Warmblood Filly. 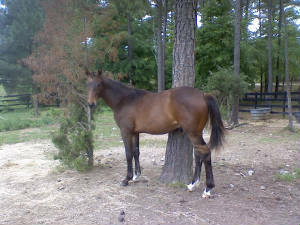 Bella has been shown in the Hunter Breed shows, and was Best Young Horse or Reserve Best Young Horse all but one outing. 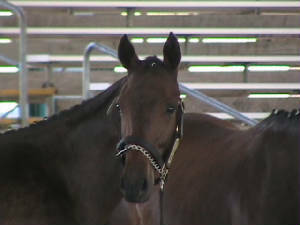 She was Reserve Champion for her Zone, Reserve Champion 2 Y.O. 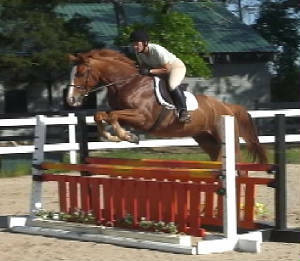 Dutch Warmblood for the USA in 2008. 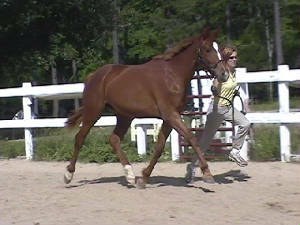 She is being started under saddle this Summer, and is an outstanding and willing athlete! 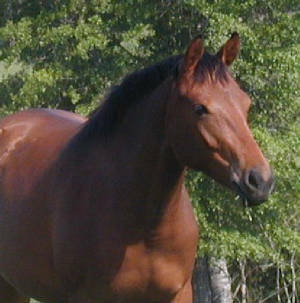 Bekkah ES, by Flemmingh, out of Tigris, by Nicholas x Dederick. 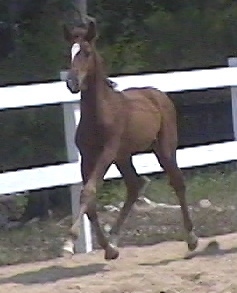 2006 Dutch Warmblood filly. 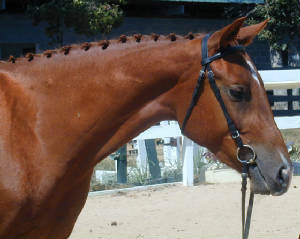 Bekkah has the most fabulous of temperaments, and is a lovely, floating mover with great potential for any discipline. 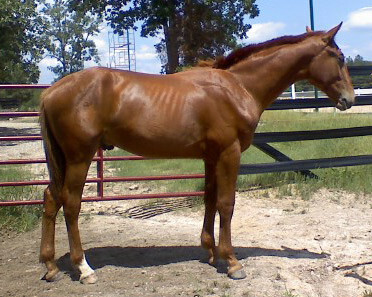 she will be started under saddle this Summer! 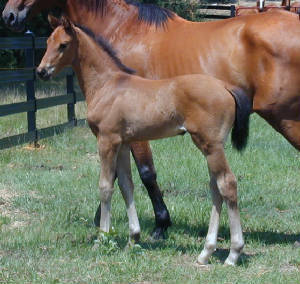 2005 Horses...how they have grown!